I bought this 4 disc DVD set from Big Lots for $6 last year and have finally started reviewing the films on it over at "The Mill Creek Horror Watcher". I have to say that it is my favourite out of all the Mill Creek Entertainment multi-movie packs so far. The movies themselves vary in transfer quality but they are all watchable especially on a laptop or portable DVD player. I've tried them on my big TV with an upconverting DVD player and, although the flaws are more evident, there's nothing too distracting. I have the older version of this pack with Vincent Price's face on the front (above left) rather than the lovely new artwork that Mill Creek have replaced it with. The 4 DVDs (containing 5 films on each) come in a very well made black plastic DVD case rather than cardboard sleeves and each DVD has matching artwork on it rather than being blank looking flippers. There is also a previous incarnation of this set (above right) with 6 DVDs in it containing 20 movies too. Something I found interesting was that the picture of the skeleton touching Carol Ohmart's shoulder from "The House on Haunted Hill" is the background on all the DVD menus. They must have been created to match the older packaging. I'm sure you'll agree that the artwork on the new version is much more contemporary. All three packs still contain exactly the same movies though. The only thing that would have improved this collection for me would have been if a couple of the more science-fiction titles had been replaced with "Carnival of Souls" and "Nosferatu". 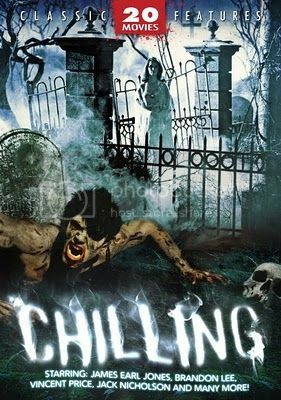 Even "Horror Express" would have fitted better into the "Chilling" category. 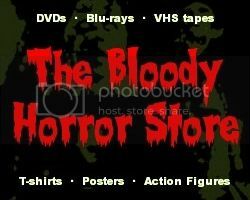 For $6 (or even cheaper used from Amazon), I can wholeheartedly recommend this movie pack to everyone no matter how old or young you may be or what your tastes in horror are. There's something here for everyone and some definite classics which you just have to have in your collection. "This collection of thrillers features such Hollywood legends as Vincent Price, Jack Nicholson, David Janssen and James Earl Jones. Terrors from above and below, creatures real and imagined and beings from beyond space and time are presented to you in this 20 Movie Pack."